Trains roar in and rattle out of the station. Endless cups of tea are pour and drunk and the lovers swoon in each other’s arms to the swelling strains of Rachmaninoff. Then somebody grabs a banjo and breaks into a song-and-dance. Make no mistake: this is not your mother’s melodrama. Kneehigh Theatre of Cornwall, UK, has brought its hit London production of Noel Coward’s “Brief Encounter” to American Conservatory Theater in San Francisco, scrubbing off the soap in this quintessential tearjerker with laughter and transforming the entire experience into a hip hybrid that you just may remember as long as Alec and Laura recall their unconsummated love. “Brief Encounter began its theatrical journey as “Still Life” back in 1936, part of a series of one-acts Coward penned and starred in along with his longtime collaborator Gertrude Lawrence under the umbrella title, “Tonight at 8:30.” In 1945 a lengthened version with the new title was released on film. Starring Celia Johnson and Trevor Howard and directed by David Lean, it became an icon of the genre, laden with longing looks, swelling music and a single tear running down the heroine’s face in close-up; that sort of thing. 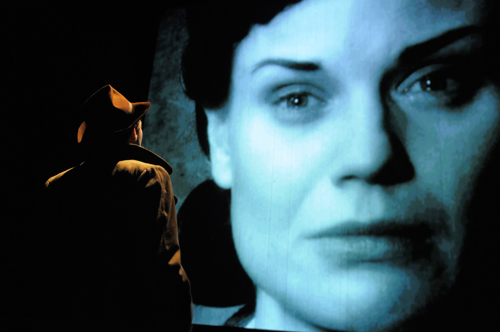 Kneehigh pays homage to the classic movie by running scenes in black and white on an onstage screen and then having the real-life actors step in and out of the frame. You have to see it to believe it but, believe me, it’s quite wonderful, as are the miniature trains, puppet children and corgis on leashes held by proper British matrons meant to remind you of You-Know-Who. (Actually the corgis are expertly manipulated dust mops). The production is chock full of such gimmicks and sight gags and peppered with routines and musical numbers straight out of a music hall (composed by Sir Noel, of course). The simple story of two respectable married people (Hannah Yelland and Milo Twomey) who meet by chance at a railway station café and fall madly into hopeless love nearly gets lost in the shuffle. It is echoed and commented on by two less dramatic but far more entertaining pairs of lovers. The pert, sharp-tongued café proprietress (Annette McLaughlin) fancies the kindly station master (Joseph Alessi). Beryl, the slightly dim waitress (Beverly Rudd) has a crush on the guy who sells candies and pastries on the platform (Stuart McLoughlin). The big difference lies in the fact that, while Alec and Laura try to repress their illicit longings, the other couples – after a bit of protestation for appearance’s sake – are only too happy to lustily give in. The cast is fleshed out by two onstage musicians, Eddie Jay and Adam Pleeth, who double as chorus, soldiers and anywhere else they are needed. Alessi also plays Fred, Laura’s affable but slightly detached husband. Rudd and McLaughlin take on all the minor female roles. They all are excellent, as is the entire production, directed by Kneehigh Theatre’s artistic head, Emma Rice, who also adapted the script incorporating her troupe’s penchant for comedy and song. For the die-hard romantic, loyal to the melodramatic excesses of the film, the irreverent approach may seem like sacrilege. And, in the first act, the silliness does somewhat dilute the story of Alec and Laura who are essentially playing it straight. But in Act Two, when Twomey and Yelland are given freer rein to express their frustrated desire for extended periods of time, you may find yourself wishing for someone to send in the clowns already. For a 21st Century sensibility, this “Encounter” is well met indeed.